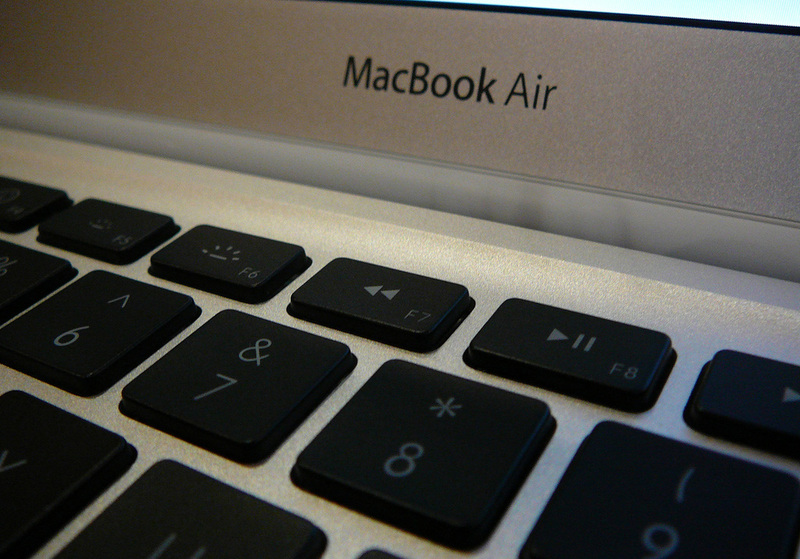 It is almost three months since I took delivery of a Refurbished 11″ MacBook Air and I can confidently state that it is the best laptop I have ever used – lightweight but robust, elegantly minimal, powerful and fast. Taking inspiration from my favourite podcast, I’m going to discuss why the Air is more than enough Mac for me, focusing on how I’ve set it up; the apps I’ve installed; modifications I’ve made; and what it’s like using and writing on Apple’s smallest laptop. To begin with I took a leaf out of Patrick Rhone’s book and completed a fresh install, excluding the additional languages and the majority of iLife applications (only keeping iTunes to manage music and podcasts). This saved me almost 8GB’s of space on the SSD. My intention from the outset was to use the Air for a minimal set of purposes: writing, reading, browsing and communicating. As such, I have no need for a photo management application and certainly don’t need audio and video editing tools. Listed below are the only applications that I have installed. The first eight were tools that I use regularly on my MacBook Pro and I knew that I would want them on the Air. The last five apps I’ve installed as I needed them or learned about them. Chrome – My browser of choice and the only way Flash gets anywhere near my Mac! Reeder – Synced with Google Reader, I’ve only recently added this but I’m loving the minimal UI and range of built in services. As I’ve done with every Mac that I have owned, I made some modifications to some of the built in features. Caps Lock – I turn caps lock off on my Macs, I never use it, and it’s more than a little annoying if you catch it by accident. Expose and Spaces – Both turned off as I never use them, I’m a one app at a time guy. This will have turned off dashboard entirely, if you try to hit F12 to start the dashboard nothing will happen. The dock will now be pinned to the bottom left of the screen. You should now see a classic 2D dock. Trash – Set to delete without confirmation. What is it like living with 2GB RAM, 128GB HardDrive and an 11″ Screen? In terms of storage, the one additional purchase I made when I got the MBA was a G-Drive Mini (500GB) external hard drive, this is where my iTunes Music folder is hosted as well as storage for Time Machine back-ups. As such the 128GB hard drive has barely been hit, as of writing this I still have 108.35GB available. I’m starting to think, based on my setup, that the 64GB model would have been enough. 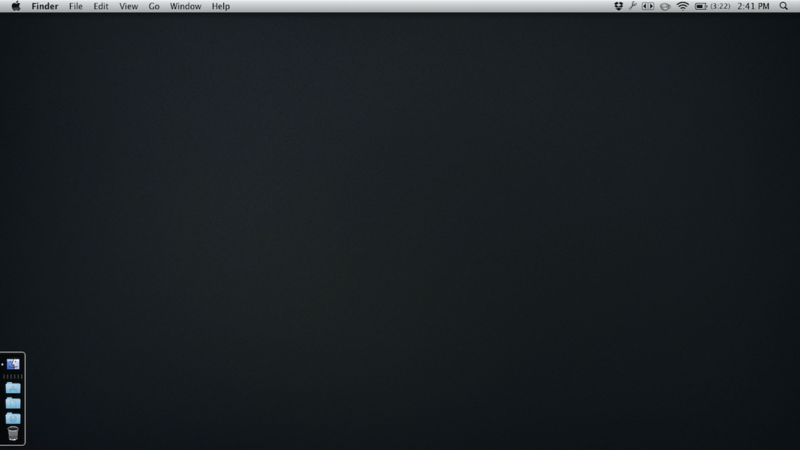 The one feature that seems to have caused issues for some Mac users is the small screen size. However, I find the 11″ screen to be more than ample for my needs. As I use several apps (including nvALT) in full screen mode, the 11″ screen has little impact on the what I’m doing. It’s barely a compromise when considering the speed and portability that the Air offers. And what about the writing? 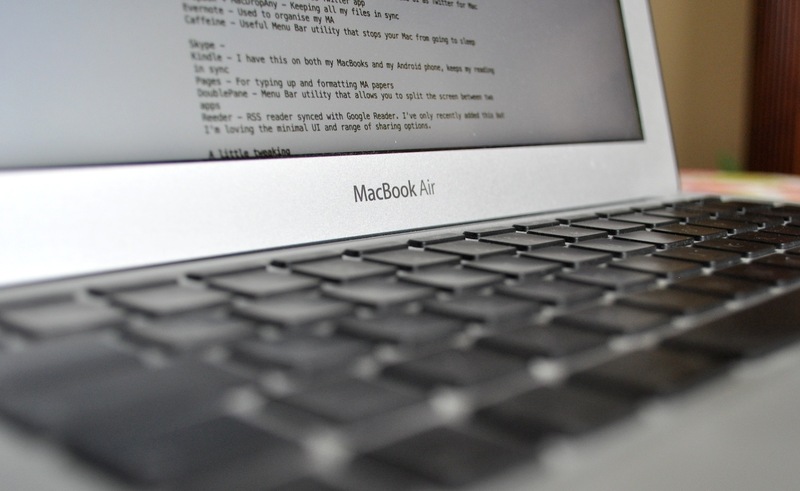 The primary reason for purchasing the MacBook Air was to have a dedicated writing/blogging machine. I have been more than pleased with the way that the Air has served this purpose. Since taking delivery of it, I’ve written every blog post and my last MA paper on it. With a full size keyboard included I haven’t seen a single difference between typing on the Air and the MBP. The keys sit slightly lower but they make the same wonderful ‘clickity clack’ that I’ve come to love. 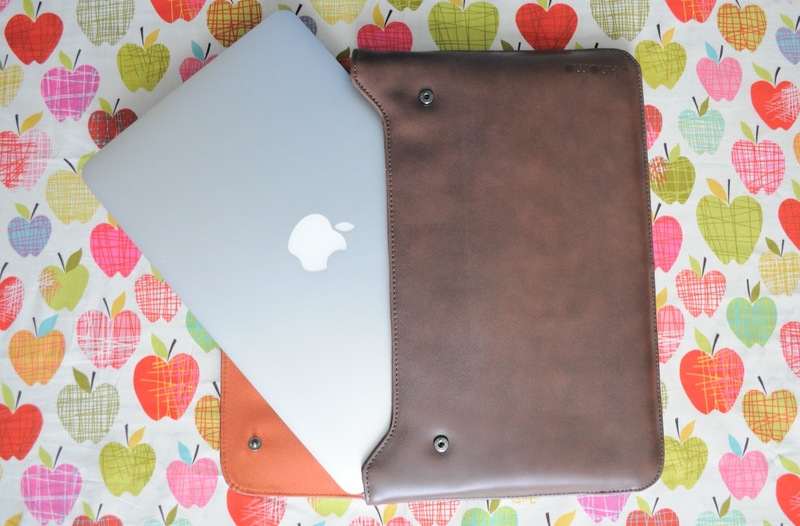 Other MacBooks that I’ve owned have simply not been comfortable to use when rested on my lap but the Air is so light I can literally sit anywhere (sans-desk) and write comfortably. 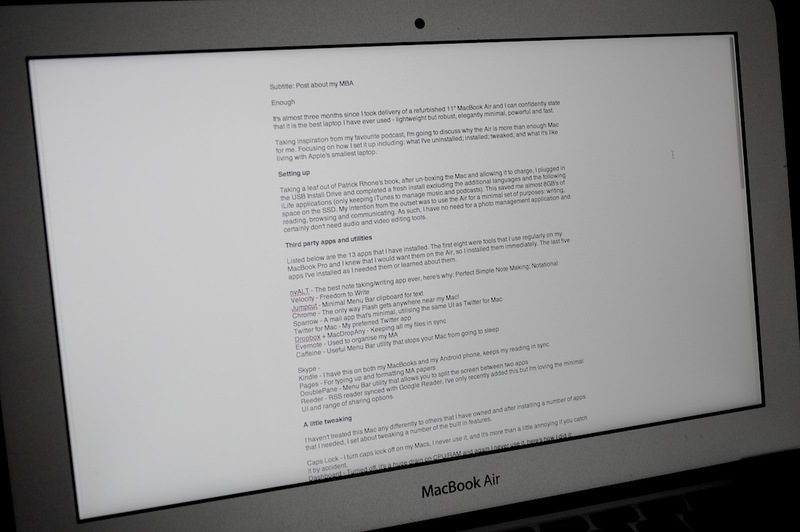 Combine that, the portability, and the focus that nvALT (in full screen mode) offers and it’s no surprise that I’m getting the writing done with far less friction. 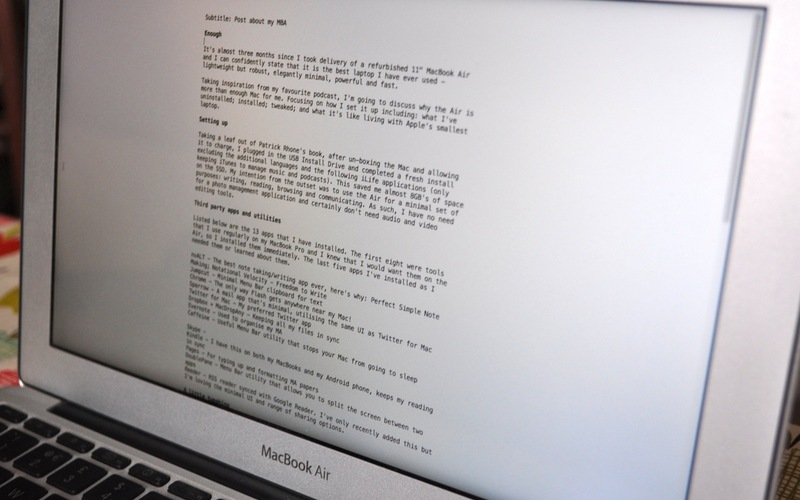 The MacBook Air is light, minimal, perfect for writing, browsing, and communicating. It’s definitely more than enough! 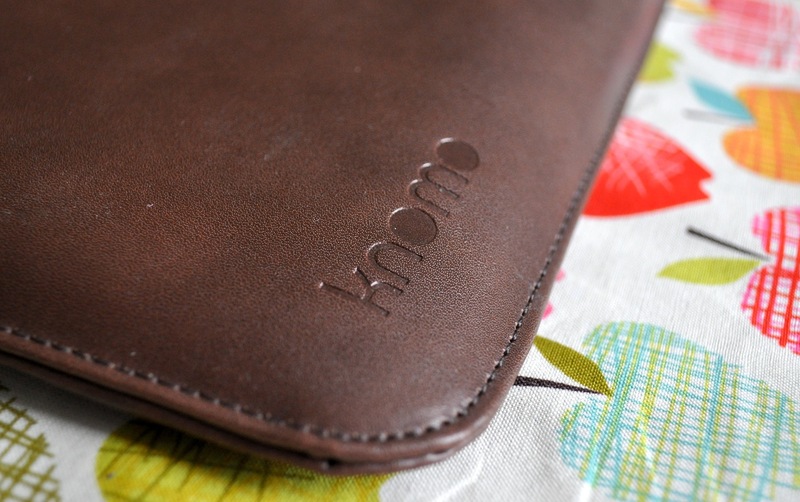 Here’s a little eye candy… the bag is a Knomo MacBook Air Envelope. Posted on Saturday, 6 August 2011 Sunday, 4 May 2014 Categories Design, TechnologyTags air, design, ftw, full screen, macbook, nvALT, TechnologyLeave a comment on Full Screen FTW! Managing my iTunes library – Have added less than 300MB this year in comparison to 30GB over the previous four. 128GB is more than enough space for me to maintain my iTunes library. The footprint of the free and open source apps that I will be installing (Google Chrome, Sparrow, Twitter for Mac, Notational Velocity and Evernote) is very minimal – less than 300MB. This small footprint combined with the fact that the laptop is light weight (1.06kg), small and yet durable with a full size keyboard makes it the perfect laptop for a minimalist like myself. In addition to this, it is simply a beautifully designed machine. Now, I’ve just got to save up the cash.